Take your adventure to the next level with this South Coast combo tour on a beautiful outlet glacier and a stunning lagoon. This tour combines our most popular glacier walk, the Blue Ice Experience, with an amazing iceberg boat tour on the Fjallsárlón glacier lagoon. Twenty minutes before your Glacier Walk tour starts in Skaftafell, you will meet your certified glacier guide at our base camp next to the National Park Visitor Center. Your guide will fit you with appropriate gear for the glacier, such as a harness, ice axe and crampons. During your 2.5 hour Glacier Walk on the outlet glacier, you will witness a wonderland of ridges, crevasses and ice formations. After your glacier hike, you head over to Fjallsárlón Glacier Lagoon on you own. There, your Zodiac Adventure boat awaits you for a boat tour in iceberg filled waters. The drive to Fjallsárlón from Skaftafell takes approx. 40 minutes (see map on voucher). Your Zodiac tour starts approx. 1.5-2 hours after you finish your glacier walk, so there is enough time to have lunch between tours. The newly renovated restaurant Frost at Fjallsárlón Base offers a good selection of home cooked dishes, sandwiches and soup, if you want to buy lunch before your iceberg boat tour. When you are ready, you will suit up and head out onto the lagoon. The small and agile Zodiac boats give you a chance to sail right next to the most interesting icebergs . You will even get up close to the massive icefall of Fjallsjökull glacier terminal face. If you are lucky, you might see a piece break off the edge of the glacier and into the lagoon. Both tours are operated by professional guides and guarantee a small-group experience. 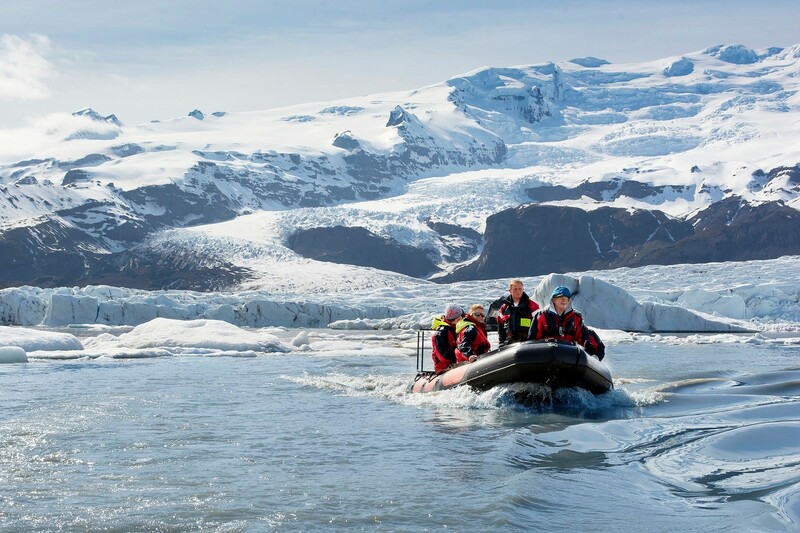 If you are looking for a day packed with adventure in Vatnajökull National Park at a discounted price, this is the tour for you! Terrific tour with an amazing guide. Worth every penny. Spent the morning walking on the glacier and the afternoon on the boat... I would do this tour again in a second. Taking the boat in the lagoon is not to be missed, the power of nature is truly awesome. This tour felt very natural and immersive, i/e it does not make you feel like a tourist. The group was small and friendly - all active people who enjoyed nature.